October | 2012 | Quo Vadis? Located to the right of the library LCD screen. 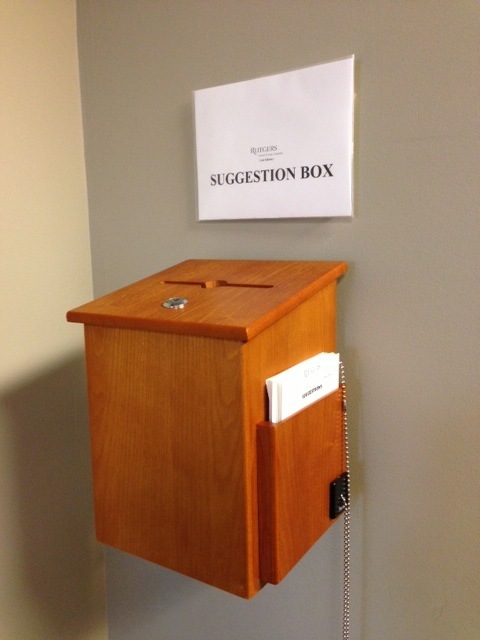 The library now has a Suggestion Box! We want to hear from you! How are we doing: services, collection, space, etc.? The box is located on the wall to the right of the LCD screen between the circulation and reference desks. Pre-formatted cards are provided. Should you want to remain anonymous, feel free to leave your name off the card. Students and faculty can also leave comments via the law library homepage. Click the link for Suggestions and Complaints. Since you will be asked to log in to the intranet, these suggestions and comments are not anonymous.